Alcohol use is pervasive in the United States. In the transition from nonhazardous drinking to hazardous drinking and alcohol use disorder, neuroadaptations occur within brain reward and brain stress systems. One brain signaling system that has received much attention in animal models of excessive alcohol drinking and alcohol dependence is corticotropin-releasing factor (CRF). The CRF system is composed of CRF, the urocortins, CRF-binding protein, and two receptors – CRF type 1 and CRF type 2. 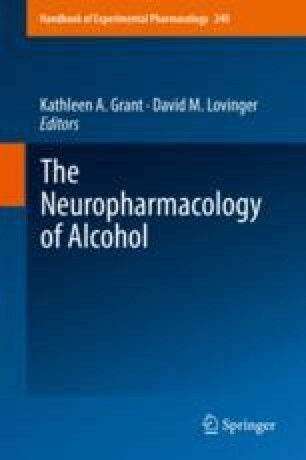 This review summarizes how acute, binge, and chronic alcohol dysregulates CRF signaling in hypothalamic and extra-hypothalamic brain regions and how this dysregulation may contribute to changes in alcohol reinforcement, excessive alcohol consumption, symptoms of negative affect during withdrawal, and alcohol relapse. In addition, it summarizes clinical work examining CRF type 1 receptor antagonists in humans and discusses why the brain CRF system is still relevant in alcohol research.